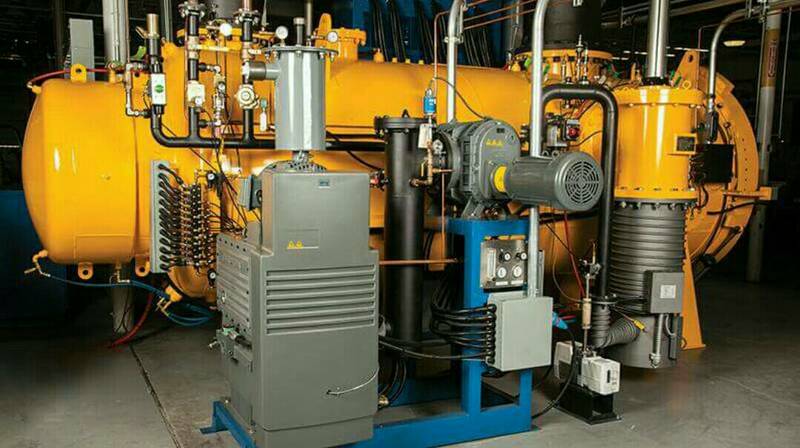 Application Of Vacuum Pump In Food Processing Industry The application of vacuum pump in food processing is mainly in the freezing and drying process, which is often called the vacuum freezing technology in the industry, which is recognized as the most advanced food processing technology in the world. Vacuum pump supporting machinery: freeze drying equipment Principle of vacuum freeze drying: According to the theory of phase equilibrium thermodynamics  the triple point of water (gas, liquid and solid phase coexistence) temperature is 0.0098 ℃  triple point pressure of 609.3 pa (4.57 mm/mg) in the process of phase change of the water, when the pressure is lower than the triple point  solid ice can be directly converted into gas water vapor is sublimation. Vacuum freeze drying of material contains a lot of water is frozen in advance to make material free water of crystallization and freeze solid after swimming under the condition of high vacuum sublimation in the material, after waiting for sublimation to remove part of the adsorbed water in the material, the resulting residual water is 1-4% of dry products. Vacuum freeze – drying is called freeze – drying for short.